BUDDY MILES-ALL THE FACES OF BUDDY MILES. During his career, Buddy Miles was a member of Ruby and The Romantics and The Ink Spots before founding The Electric Flag with Mike Bloomfield in 1967. Then in 1969, Buddy Miles became the drummer for Jimmy Hendrix’s newly formed The Band of Gypsys. Although the band was short lived, Buddy played on the platinum certified The Band of Gypsy’s album. Following his spell with Jimi Hendrix, Buddy Miles not only became a producer, but embarked upon a successful solo career. Starting with 1970s We Got To Live Together released on Mercury, Buddy would then release both A Message To the People and Them Changes in 1970, before releasing Buddy Miles “Live” in 1971. While Buddy hadn’t released a solo album for three years, Carlos Santana and Buddy Miles Live had proved commercially successful. So after an absence from the studio of four years, Buddy Miles decided he’d start recording his fifth album. This would be All the Faces of Buddy Miles, which will be rereleased by BBR Records on 23rd April 2012. Before I tell you about the music on All the Faces of Buddy Miles, I’ll tell you about background and recording of the album. For recording of All the Faces of Buddy Miles, Buddy recruited Johnny Bristol to produce the album. He’d produced a number of successful albums for Motown artists, including Gladys Knight and The Pips, Stevie Wonder and Edwin Starr. For his band, Buddy decided to recruit a number of Motown musicians. This seemed strange, given Buddy’s contacts within Philadelphia. Previously, Buddy had played drums for The Delfonics, so had many contacts with the Philadelphia music community. Instead, Buddy brought in a rhythm section of bassist James Jamerson, drummer Edward Greene and guitarist Melvin Ragin a.k.a Wah Wah Watson. Add to this keyboard player Clarence McDonald and saxophonist Ernie Watts who’d just finished working with Marvin Gaye. With a stellar, all-star band backing him, Buddy headed to the studios in North Hollywood. Recording took place at Devonshire Sound Studios in North Hollywood. Arranging the the tracks on All the Faces of Buddy Miles was H.B. Barnum, while Johnny Bristol produced the album. The addition of Johnny Bristol as producer meant All the Faces of Buddy Miles meant a quite different sounding Buddy Miles album. There’s more of Motown sound on the album, than the usual Buddy Miles’ sound. Not that Buddy Miles resented this change in sound and style. Quite the opposite, he welcomed it, treating the sessions as a process of musical discovery, where he experienced new ideas and ways of working. With All the Faces of Buddy Miles recorded, all that was left was for the album to be released. The first single released from All the Faces of Buddy Miles was We Got Love, which was released in November 1974, reaching number 108 in the US Billboard 100. When All the Faces of Buddy Miles was released in November 1974, it failed to chart. Pull Yourself Together was the second single released from the album, reaching number eighty-three in the US R&B Charts. Although the two singles had some success, reaching the lower reaches of the charts, the failure of All the Faces of Buddy Miles commercially was a disappointment, especially given the quality of the music on the album, which I’ll now tell you about. Opening All the Faces of Buddy Miles is Pull Yourself Together which opens with a rasping horn, Buddy’s soaring vocal, before you get the first chance to hear this slick and accomplished band Buddy’s put together. The rhythm section, keyboards, lush strings and blazing horns give way to Buddy’s heartfelt, soulful vocal. Guitars and backing vocalists accompany him, while the drums provide the track’s heartbeat. It’s a very different, smoother sound to that on his collaboration with Carlos Santana, with producer Johnny Bristol’s influence responsible for this polished, soulful sound. The finishing touch are the backing vocalists that accompany Johnny. Together with his multi-talented band, he gives an emotive, heartfelt delivery of what is, a very beautiful song. We Got Love was written by producer Johnny Bristol. The track is perfect for Buddy’s vocal, as is the arrangement, with its rocky guitars, backing vocalists and lush strings that accompany the rhythm section. Key to the success of the track is Buddy’s powerful, impassioned vocal. Later, a braying horn drifts above the arrangement, while screaming guitars and pounding guitars combine. However, what makes the track is the power, passion and emotion in Buddy’s vocal. Buddy drops the tempo on All The Faces, a slow, sad song. The arrangement has a much more understated sound, with the rhythm section playing subtly, while swathes of strings, steel guitars and Hammond organ add an atmospheric backdrop. Backing vocalist accompany Buddy, adding the sadness and emotion of the track, while later a rasping horn hangs over the subtle arrangement. Here, we hear a quite different side of Buddy Miles, one although full of sadness and regret, that’s bewitching and beguiling. I’m Just A Kiss Away is another Johnny Bristol song, with a trademark Johnny Bristol arrangement. Here, Buddy delivers the lyrics about standing in front of a church, awaiting his bride’s arrival knowing that kiss will lead to happiness, if not with a swing, but pretty near it. There’s joy and happiness in his voice, as his band provide a jazz tinged arrangement. The rhythm section, blazing horns and piano combine to provide a catchy, jazzy arrangement that swings along irresistibly. An atmospheric Hammond organ, piano and blazing horns combine as It’s Only The Good Times opens. They accompany Buddy as he delivers the lyrics accompanied by swooning backing vocalists. The addition of strings and female backing vocalists add to an arrangement that combines jazz, soul and blues, reminding me of something Ray Charles would sing. Meanwhile, Johnny sings about the end of a relationship, looking back and remembering the good times, with a song reaching a crescendo, with gospel tinged backing vocalists and Johnny combining to create a mesmerizing ending to what is, one of the many highlights of All the Faces of Buddy Miles. Got To Find Ms. Right is a track that quickly explodes joyfully into life. As Buddy is accompanied by the rhythm section, chiming guitars, Hammond organ, cascading strings and blazing horns, the track begins to reveals its charms and beauty. Buddy’s vocal mixes power, passion and longing, while backing vocalists augment his vocal. Here, Buddy, his band and producer Johnny Bristol surpass themselves. Not only is this glorious sounding track that fuses soul and jazz joyous and laden with passion, but it’s the best track on the album. Trying to match of the quality of the previous one isn’t easy, but wisely, Buddy decides to change the style of music on Pain. it’s a much slower, moody and sad sounding track, with just a keyboards, shimmering strings and an understated rhythm section combining. Backing vocalists play an important role in the track, while later, haunting, rasping horns combine beautifully with the strings. Buddy’s vocal is full of hurt and pain, which is reflected in the haunting, atmospheric arrangement. Although very different from the previous track, it’s a really compelling, haunting song, laden with hurt and Pain. Kiss And Run sees a myriad of keyboards, guitars and rhythm section explode into life, with Buddy’s vocal an impassioned roar. The arrangement mixes soul and funk, with Buddy’s band kicking loose. Lush strings provide a contrast to the blazing horns, wah-wah guitars and driving, dramatic rhythm section. This is the perfect track for his band to demonstrate their talents. They do this aplomb, the horns howling, guitars funky and rhythm section providing a masterclass, as Johnny joins his band and kicks loose, as he and his band prove they can rock like the best. Wants And Needs (The Earth Song) is the fourth Johnny Bristol song on All the Faces of Buddy Miles, with this a much more traditional sound after the previous track. Here, a dramatic opening gives way to punchy horns, shivering strings, wah-wah guitar and the rhythm section, while flourishes of piano drift in and out the track, Buddy’s voice is deeper and louder, with a backing vocalist replying to his call. Behind him, his band give a masterclass, proving the benefit of having experienced, talented musicians accompanying him. With Johnny Bristol producing the track, everything is in place for another accomplished and quality track from Buddy Miles. Closing Buddy Miles fifth solo album All the Faces of Buddy Miles, is Baby Don’t Stop (Sit On The Rock). It has a hesitant start, with hissing cymbals, percussion and moody bass combining, before gradually the track awakens. The Hammond organ, stabs of rocky guitar and drums all enter, before taking the track in a direction where jazz and funk meets. Blazing horns, pounding drums and bass, Hammond organ and rocky guitars combine for a jazzy jam. You can only sit back and marvel at this tight and multi-talented band, as they end the album with joyous, sometimes frantic and dramatic fusion of jazz and funk. Buddy Miles fifth solo album All the Faces of Buddy Miles is an amazing album where he mixes soul, jazz and funk seamlessly. Produced by Johnny Bristol, this to me, is the best album that Buddy had produced. There are so many great tracks on All the Faces of Buddy Miles with the jazzy I’m Just A Kiss Away giving way to the joyous fusion of soul and jazz that’s Got To Find Ms. Right. Pain is a compelling and haunting song while on Kiss And Run Buddy and his band kick loose, mixing soul and funk with a touch of rock. Wants And Needs (The Earth Song) was the fourth and final Johnny Bristol penned song on the album, with Buddy delivering Johnny’s lyrics with aplomb. Overall, All the Faces of Buddy Miles is a highly accomplished, polished and hugely satisfying album, that anyone who loves soul, jazz and funk will adore. I can’t recommend All the Faces of Buddy Miles enough. It’s an album that deserves to find its way into every music lover’s collection. 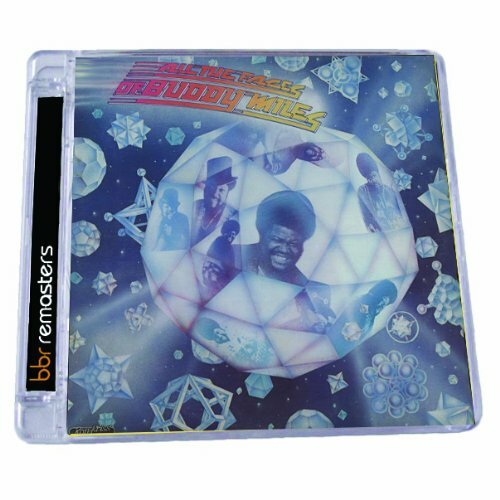 The remastered rerelease of All the Faces of Buddy Miles will be released on 23rd April 2012 by BBR records, along with a bonus track, the single version of We Got Love. This rerelease of All the Faces of Buddy Miles is the perfect opportunity to discover the best solo album Buddy Miles released during his long and illustrious career. Standout Tracks: We Got Love, I’m Just A Kiss Away, Got To Find Ms. Right and Pain. ← ANDRE CYMONE-SURVIVIN’ THE 80’S.